Have you noticed how clique like adults are? I thought we were supposed to grow out of it when we graduated. Maybe somebody should have told us that it wouldn’t be any easier to integrate our social circles as adults than it was as kids. We watched The Breakfast Club and thought, ‘Yeah, I’m not going to allow anybody to label me!’ But we continued to label others and often try to avoid those with undesirable labels. 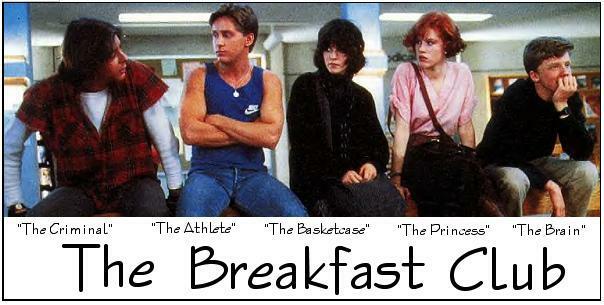 Try thinking about the characters in the 80’s classic The Breakfast Club and who they grew up to be. We have ‘The Criminal’ and ‘The Athlete’ who likely went out and got blue and white-collar jobs respectively. ‘The Brain’ got a Master’s degree (if not a PHD) in something useful and now likely owns their own company, gives TED Talks, conducts all sorts of important research etc. Each comes in the male and female varieties. But, the girls? Well, the girls seem to me to be primarily defined by their marital status. ‘The Princess’ got married before she turned 29, while those of us who identified with the ‘Basketcase’ are enjoying our 30s and 40s as single women. Maybe I’m thinking to deeply about a John Hughes film. The point is, we’re still labeling, and we’re still congregating around the labels we’ve chosen for ourselves. The problem is the same as it was in high school. When we only spend time with persons who are similar to us, sure conversation is relatively easy. These small social circles become breeding grounds for (at best) isolated ignorance and at worst severe prejudice. Additionally, I find that when I mingle strictly with those individuals with whom I have much in common I begin to lose any sense of self. I begin to ask, “Who am I?” What a ridiculous question! The truly frightening conclusion is that my answer begins to come back tritely packaged as ‘The Basketcase’ ! I’m single, female and over 30. The general consensus is that there must be something wrong with me! At the least I’m too picky and at the worst I’m on the fast track to being the lady who claims several dozen felines. So, how do we address this rampant social segregation, these juvenile cliquish tendencies? We must diversify our social set. My 13- and 17-year-old brothers: They keep me in-touch with what’s hip and cool while reminding me what my values are and why I hold them so close to my heart. Incidentally, I find that we behave better as adults when we know an impressionable youth might be watching. A young married mother: she is my biggest cheerleader and challenger. We are so very different…but we value each other more because of those differences. BONUS: she comes with baby cuddles! An atheist with a pair of bachelor’s degrees (I’m a Christian with a piece of paper that confirms I went to a conservatory for the study of physical theatre for precisely one year): she challenges and questions my beliefs. Plus, she thinks I’m smart, and since I think she’s smart. I tend to believe her. May I offer you a challenge? Go make friends with someone with whom you have little to nothing in common. Try it! You might learn something and you might just find that your differences aren’t so great after all. There’s an education to be had; a point of view to see; a thought process to learn. And maybe you’ll effect change in the other or maybe they’ll effect change in you. If you’re really lucky, you’ll both be better for the exchange. End-Note: I actually set out to talk specifically about the segregation and exclusion of singles in our culture. I was going to get up on my soapbox and whine about how we singles (especially us girls) feel like outsiders. Maybe someday I’ll share those thoughts in more detail. But here’s the thing: I can’t change you. I can only change me. So, I’ll continue to seek out the others. I won’t make my social comfort your responsibility; it’s mine, after all.